Find innovation at your fingertips with AutoCrib. 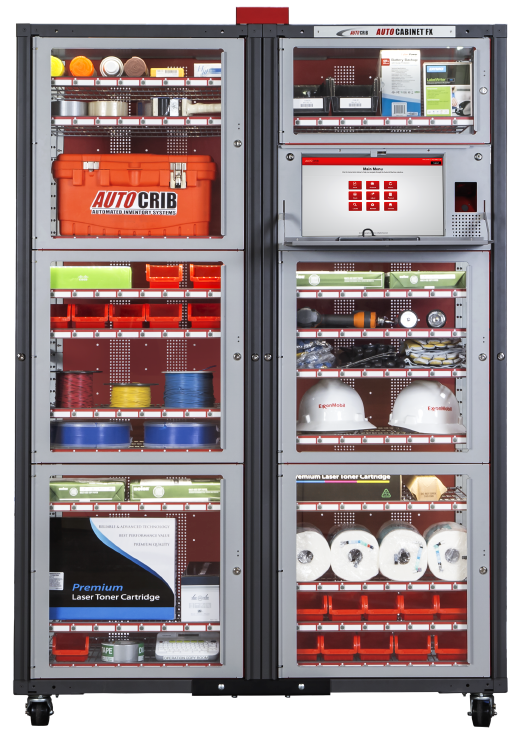 Thanks to a versatile, web-driven design, AutoCrib makes it easy to control your inventory and gain enterprise-wide visibility through any connected device. Access the widest range of purpose-built industrial vending machines, including carousel systems, RFID portals, dispensing systems, electronic locker/door access systems, counting scales and more. Reduce consumption, improve inventory management and store just about anything with this innovative, glass-face vending solution. Designed for high-demand environments, this industrial vending system offers the most capacity of any helix-coil machine available. Store items large or small in an automated locker system that controls each transaction independently — and can even limit access to out-of-calibration items. Easily manage gloves and other consumables with the world's only vending solution that eliminates repackaging requirements. Automated and efficient, this industrial RFID portal independently supports item tracking and manages accessibility — while completely unattended. Scan barcodes and RFID tags on the go with an innovative solution designed for mobile transactions and real-time communication. Compact and flexible, this revolutionary system securely manages item access for virtually every type of inventory — even delicate items. Cut small parts inventory down to size with the system specifically designed to manage and monitor use of inexpensive yet high-volume items.